Ever since the Guiding Hand Social Club article in PC Gamer made people think mercenaries are a thing in EVE, carebears all across highsec have threatened their enemies with the hiring of mercs. To be fair, some mercenaries do exist, though most spend their time on PvE and randomly wardeccing people, as opposed to making a living through mercenary fees. During our vacation in Abudban, we made the acquaintance of some genuine failmercs, members of the Double Tap. alliance. 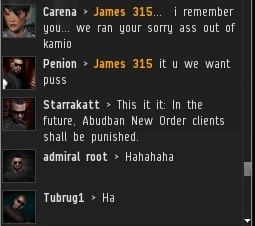 After failing to gank Agent Tubrug1's bumping ship, they turned their attention to me. Carena claimed to have chased me away from Kamio--an impressive feat, considering my Invincible Stabber was never attacked by them and, come to think of it, I didn't recall ever seeing them before. After threatening to suicide gank my indestructible ship, they demanded to know where I was. I saw no harm in telling them. 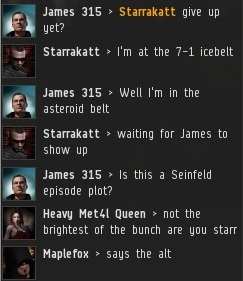 Our rendezvous was delayed when Starrakatt went to the wrong belt. Outspoken rebel miner Maplefox proved that even Heavy Met4l Queen is not safe from accusations of being my alt. When Starrakatt arrived in the asteroid belt flying his Rupture, I let him know I was ready for our duel. 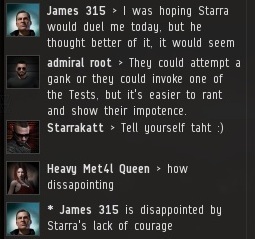 It was somewhat disappointing that Starrakatt intended to engage in a 1v1 duel, as opposed to trying to honour his merc contract by ambushing me, but whatever. We take what we can get. Starrakatt began demanding I fight him, while I did the same. When I reminded Starrakatt of his responsibility under the Code to invoke one of the three Tests to earn the right to duel me, the enemies of the New Order in local became enraged. Starrakatt insisted that I take from his can, but the ball was still in his court. Besides, it is not for the Supreme Protector to take orders, but to give them. The fearsome mercenary adamantly refused to read the Code or invoke any of the Tests. He continued to bark orders. Unfortunately for whoever hired his services, this was not a winning strategy. Starrakatt and his friends grew increasingly bewildered as I urged him to display more courage. All he could do was frantically gesture at his jetcan. 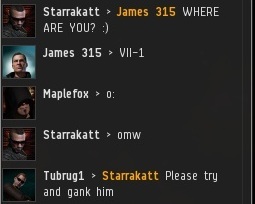 Perhaps the plan was for Starrakatt to tackle me after I took from his can, and for his fellow Rupture pilots to help gank me, exploiting the EM hole in my shields. Unfortunately, it all hinged on Starrakatt's ability to persuade me to abandon the Code protocol and take from his container just because he said so. Given the choice between the New Halaima Code of Conduct and some random failmerc's barking at me, I'll take the Code any day. But it wasn't a total waste of time, for me at least: During the entire event, I was bumping Shakka Akan's Retriever around the belt. My enemies babysat a jetcan and watched me valiantly enforce the Code. They never did try to gank my Invincible Stabber. They may be incompetent mercs, but they're not crazy. It's probably fair to say Double Tap. didn't earn their paycheck that day. They left the system in the capable hands of the New Order for the duration of our vacation. After we returned to Kamio, they no doubt advertised themselves to future clients as the mercs who ran the New Order out of Abudban. Gotta make a living somehow, I guess. Any mercenary worth doing business with would've researched his target. Whatever was paid to hire them, remember that a mining permit is far more economical & not a complete waste of time & isk. Double Tapdotte was completely useless against the fledgling Miniluv. They could not stand against our amazing 5 boots and were deathly afraid of space warrior-gentleman Titmando. Double tap is one of those special high mercs. Which find station camping... oh sorry high sec PvP fun. They should get another hobby. They announced their arrival with a failed 4-man gank attempt on my invincible* stabber right outside the station. They missed a stationery target while I was distracted by the bumping channel. 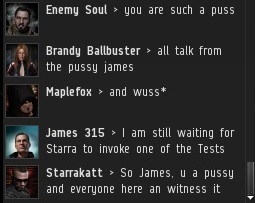 So, James needed to take the can so they though mercs could jump on him with 4 PvP cruisers. \o/ Come at me bro! Another sucsessfull victory for the new order. They not only thought theyd make money mercing out as can flippers with a gank fleet, but also thought to assault the Protector of High Sec by doing it?